We, at the EAL Radio Show, are saddened to learn of Vito's passing. He was a giant among the EAL groups. The radio show was so honored to have recognized Vito and his contributions to the Eastern Legacy a few years ago in Ft Lauderdale. He seemed so at home with his Eastern friends. Please pass our deepest sympathy to his wife and family. We will miss him greatly. Neal Holland and all of the hosts at the Eastern Airlines Radio Show. Vito Borrelli retired from Eastern Air Lines on July 1, 1987, with 20 years of service and continues the Eastern Airlines Retiree Association, “EARA” and is the organization that is preserving the Spirit of Captain Eddie Rickenbacker and The Great Silver Fleet alive and well through this organization. EARA was founded in 1984 originally by John DeRose, with headquarters at 700 South Royal Boulevard in Miami Springs, in the Eastern Financial Federal Credit Union building. There were almost 20,000 Eastern Airlines Retirees at that time, and originally the membership was $15.00 for one year ($25 for two years). John DeRose began EARA to support all the Eastern Retirees with their benefits. In January 1989, John DeRose approached Vito Borrelli to join EARA as a Communication Liaison. Vito at that time was working at Teledyne after the demise of Eastern Airlines. When John DeRose died in 1996, Vito Borrelli became President, and held the position from July 1996 through May 2001. He continues on today as Vice President of EARA. Vito vowed to continue John’s work and his greatest achievements were to gain Retiree Benefits and Privileges for the Retiree to travel, which was one of the cherished benefits lost with the demise of Eastern. As EARA's travel consultant Vito has secured arrangements with many airlines, and continues to seek more. A fabulous banquet dinner and honor was given Saturday evening, October 24, 2016 celebrating one of our most distinguished guests, Vito Borrelli, who graced us with his wonderful wife, Marie as they were welcomed by all the attendees at The 2016 2nd Annual Eastern Airlines Retirees Reunion and Celebration in his honor. Marie and Vito were joined with their 2 daughters, Margaret with her husband William Street, and Phyllis with her husband Hart McIntyre. Unfortunately their son, a United Airlines pilot was on a flight assignment and not able to be there in presence. We know that his heart was with the honor being given to his Dad. Our thanks to him for sharing his Dad so we could recognize Vito; and show him our appreciation for all he has given to us. Captain Neal Holland wanted to honor Vito Borrelli on behalf of all of the Eastern Family in a very different way while also celebrating an EAL Reunion. What better way to acknowledge Vito for all his services to us and to show him how much we all admired his tenacious attitude and his fortitude. 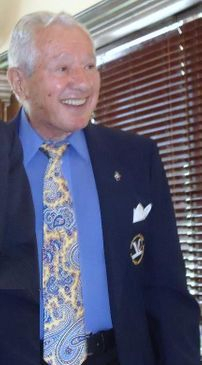 He persevered to keep our great Eastern Airlines Retirees Organization progressing, so why not a Special Recognition Banquet and Dinner to Honor Vito. Vito as we all know has gone over and far above and beyond the normal volunteering to keep his commitment that he made when EAL closed. His interaction with the prospective airline personnel to keep our travel benefits as profitable for us as he can, is highly commendable. His time, persistence and dedication to keep giving us more only makes us respect Vito immensely. Marie, his wife along with his family stands by his side. They too, have done over and above their part by sharing Vito with EARA. We know how time consuming it is and how much effort you must put into an organization to make it the best, and to continue to bring it as far as it can go. Vince Lombardi once said "Leadership is based on a spiritual quality; the power to inspire; and the power to inspire others to follow”. Vito certainly inspires all of us to do as much as we can for EARA. We know, too, that through his leadership, other member volunteers have contributed by following in his footsteps; an ongoing Board of Directors that keep the EARA organization thriving. We thank Vito, along with all those past and present officers and volunteers immensely. Captain Neal continued the honor by reading Vito a letter sent to him by Roland Moore who was in Barcelona. His meaningful words too, gave Vito the thanks he deserves. We appreciate and honor Vito as he is the kind of man that makes the Eastern Family so great. Thank you Vito, from the bottom of our hearts, and this is why we were happy to honor you at this event.